Merry Christmas Wishing Script 2018 - Agar aap Festival Wishing Websites par work karte hain to apke liye Merry Christmas Wishing Script 2018 hai jisko Merry Christmas Wishing ke liye use karke WhatsApp Viral website create kar sakte hain. First of all, Yeh bata dun ke Merry Christmas Wishing Script English language me hai that's why is Script ko worldwide viral kar sakte hain B'coz Christmas almost worldwide celebrate kiya jata hai And Script me images use karke completely Beautiful create kiya hai. 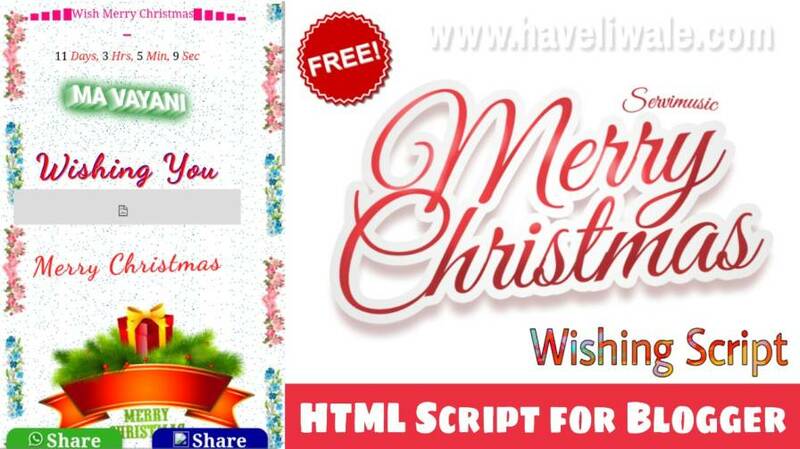 Merry Christmas Wishing Script 2018 ko HTML coding me banaya hai or yeh kafi Amazing script hai, Script me 2 share buttons milte hain(WhatsApp & Facebook) And Script Responsive or user friendly hai. Merry Christmas Wishing Script 2018 completely AdSense Friendly hai that's why is Script se AdSense ki Earning increase hone ke ziyada chance hai, Also Script sabhi Sizes ke Ads Support karti hai. Merry Christmas Wishing Script 2018 me customization bhi kar sakte hain B'coz is Script me easy HTML coding use ki hai, Script ki images or quotes HTML coding se change kar sakte hain yeh bilkul easy hai. Also yeh Script light weight hai to website ka loading time bhi kafi low hoga jis se user ko koi problem nahi hogi or user easily apki website visit kar sakte hain. Kisi bhi Festival Wishing Website ko viral karne ke kafi easy method hain directly WhatsApp se kar sakte hain But ziyada Viral karne ke liye neeche diye huwe steps ko follow kare or ziyada members wale group join karein. Agar apko Festival Wishing Website ko Blogger me setup karne nahi ata to aap How to Setup Festival Wishing Website in Blogger ko read kar sakte hain, And agar apka AdSense account Approve nahi hai to other Ad Network ke Ads lagana bhi btaya hai. Wishing you Merry Christmas from "Haveli Wale"